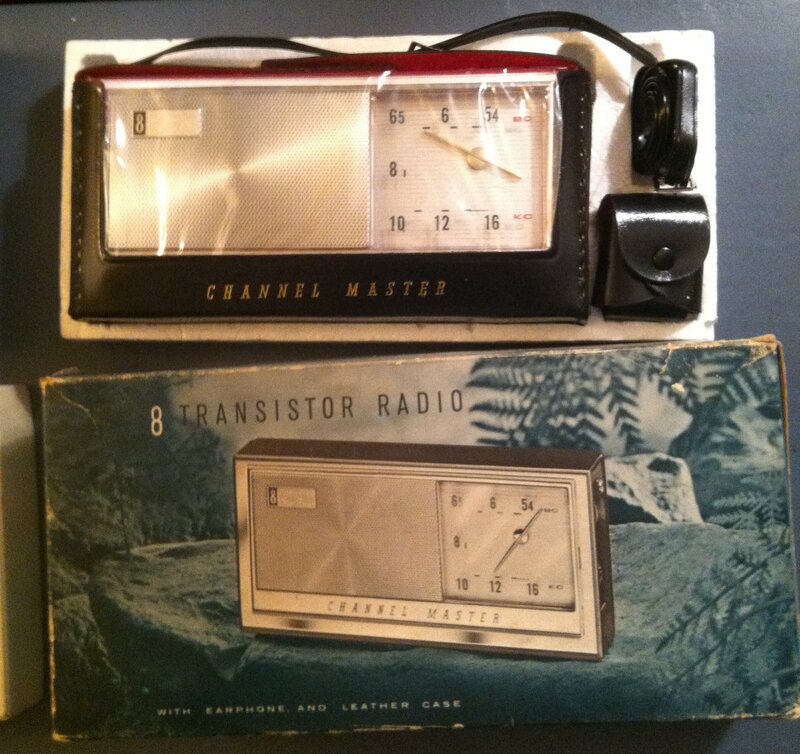 Several years ago a friend introduced me to the Channel Master 6515 Super Fringe…a beautiful 8 transistor AM portable radio manufactured by Sanyo exclusively for Channel Master throughout most of the 1960’s. 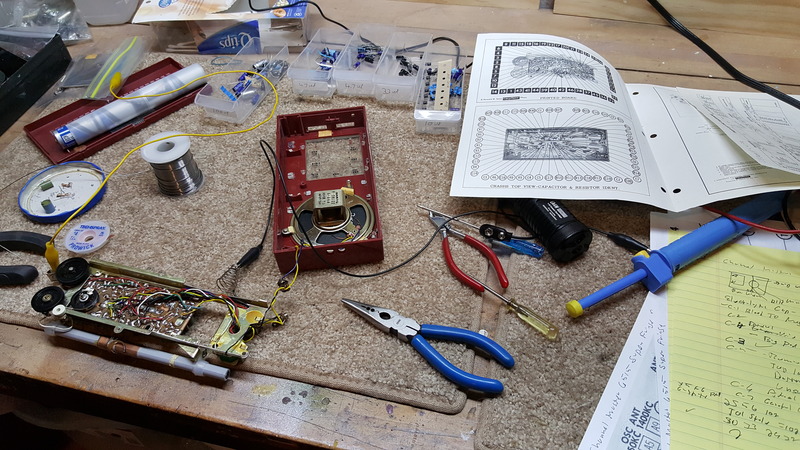 Interestingly I had been given a basket case 6515 and its little 6 transistor brother 6506 a few years before that, but both of their innards had been so damaged by previous repair attempts that I never tried to fix them. 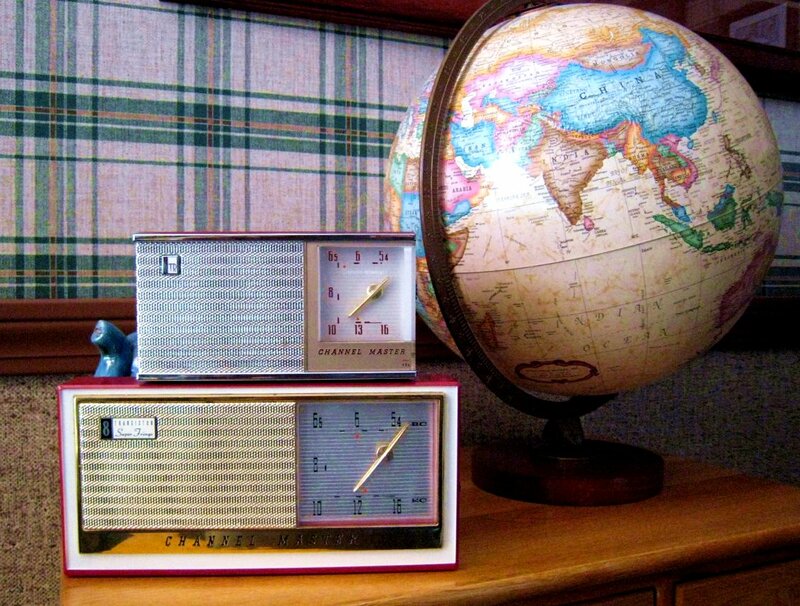 They were such attractive radios though that I put them on display and pretty much forgot about them. However my friend had a completely refurbished 6515 and when I later compared it to a Zenith Royal 500H (perhaps THE reference AM portable of the same period and approximate size and price) I was very impressed…enough so that I decided to obtain another sample to learn the nuances and see just how good the Super Fringe really is…especially in view of the fact that one of Channel’ Master’s print ads claimed it to be “the most sensitive transistor radio ever made”. ..a strong if unbelievable claim for sure. 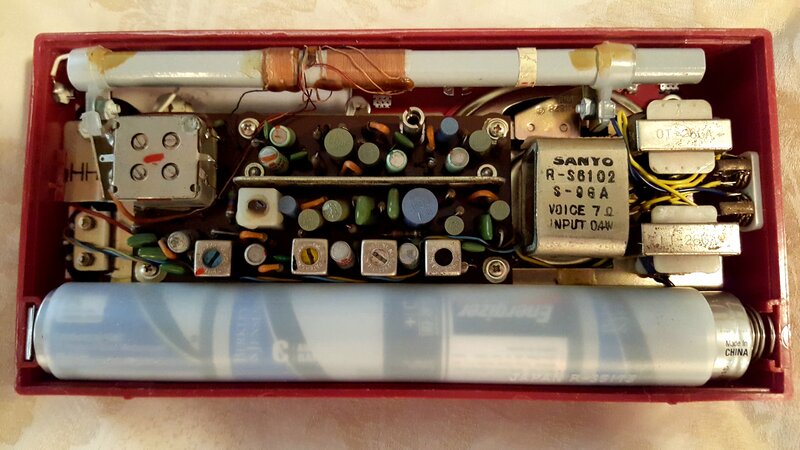 I eventually obtained two cosmetically nice samples…an original Model 6515 and the slightly restyled 6515A. 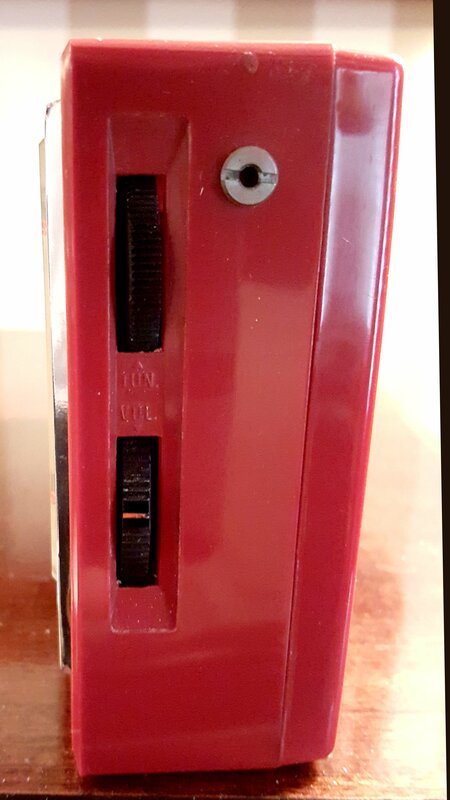 Originally selling for $59.95 the 6515 is an 8 transistor AM portable with a tuned RF stage measuring approximately 8.5 x 4 x 1.8 inches. 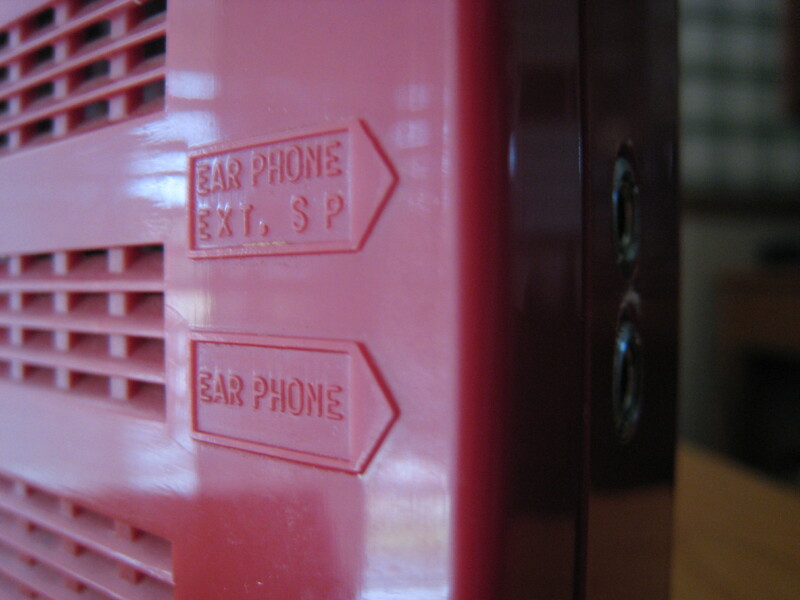 It features separate earphone and speaker output jacks and an aux antenna input jack – these last two are rare features not present in most AM portables. The 6515 also features smooth vernier tuning and a large easy to read dial with side mounted thumbwheels for On/Off/Volume and tuning. 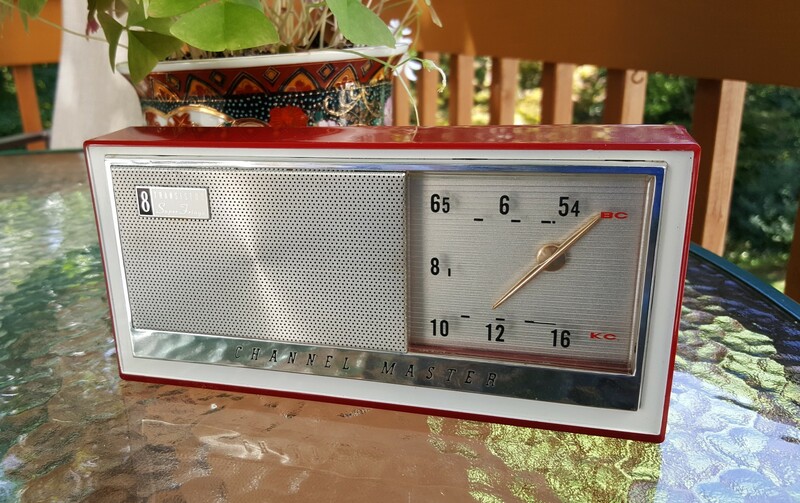 I would describe its styling and feel as luxurious…this is a simply beautiful radio to look at. 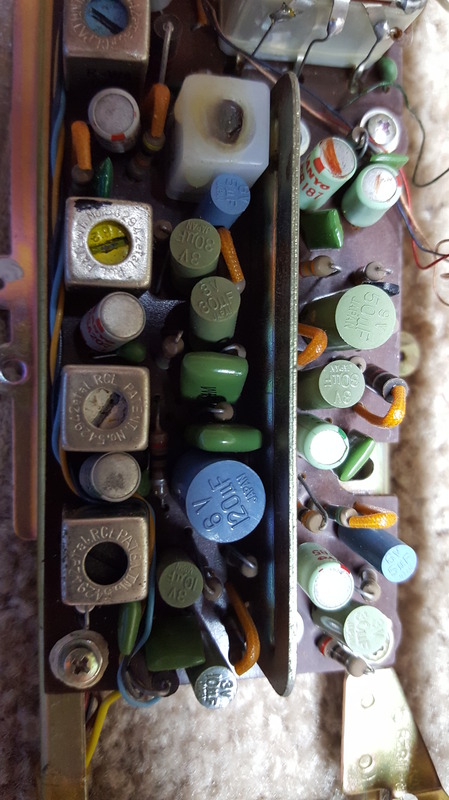 Of the several samples I eventually obtained, none worked well or at all as received…they were all in need of new electrolytic capacitors. That is not unusual but recapping this radio is not the easiest job I’ve ever done…they contain 10 electrolytic caps whereas the typical AM only portable usually has only 4, and it took some time to properly locate all the solder points on the board. Once recapped and aligned the radios seemed to be working very well and I was ready to put them up against the competition..namely a Zenith Royal 500H, long known as a reference amongst mid-sized AM portables. I eventually put three samples of each radio into the mix (3 Super Fringes and 3 Royal 500H’s) and my results are an average of the three with subtle variations unit to unit which is to be expected. The biggest differences between the Zenith Royal 500H and the Channel Master Super Fringe 6515 are their sound and their AGC (Automatic Gain Control)…they are almost opposite ends of the spectrum. Of course their styling is also opposite with the Channel Master being a horizontal design whereas the Zenith is vertical. The 500H’s audio is much stronger in the midrange…the Channel Master was mellower in the mids but still with a decent sense of clarity and a slightly more extended high frequency response. 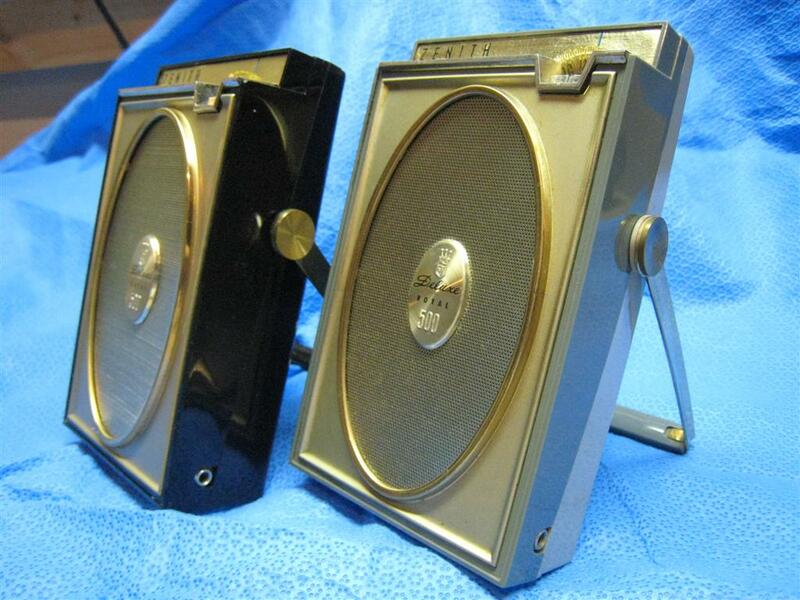 Different people preferred one or the other…many said the Zenith was brighter or clearer and the Channel Master a little mellower…others felt the Channel Master sounded smoother but more extended…more “Hi-Fi” by portable standards with a fuller sound. For me it depended on the station and program material…while they are as different as night and day I am hard pressed to choose one as best…sometimes I like one better…on other programs the other sounds better to me. I think they are both excellent sounding for their vintage and size but some listeners may strongly prefer one over the other. They certainly do have very different personalities – generally I lean towards the Channel Master as my favorite by a small margin. Reception: Here too they were surprisingly close, both coming in with **1/2 Stars in my AM Mega Shootout List of AM radios, which is very good for radios of this vintage and size. For the majority of signals, and certainly for any station you might actually want to listen to, the two radios were too close to call. From strong to medium and even very weak signals they each pulled in stations similarly. When signals were really weak (at the threshold of intelligibility), the Zenith 500H managed to play a bit louder – it was able to maintain full volume even on these extremely faint and admittedly very noisy signals whereas the Super Fringe occasionally lost some volume on very weak signals, perhaps more due to those AGC differences than outright sensitivity. Also the Zenith was a hair more selective on some very weak, crowded signals. but they were so close that unit to unit differences could easily turn the tables. Yet on most of these weaker signals the Channel Master seemed a little less noisy and its somewhat fuller sounding audio helped it too so in the end it was pretty close to a draw. Both are tops in their category. 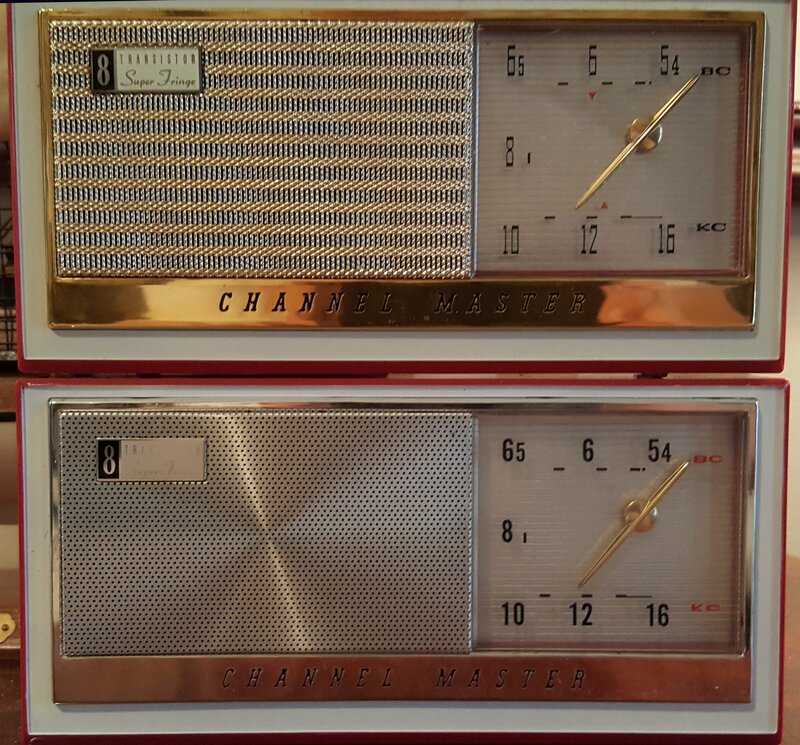 If I had to categorize them I might say the Zenith was a hair better for DXing the faintest crowded signals but for regular program listening many might prefer the Channel Master, but I wouldn’t rate one as superior to the other…they are that close. One interesting aspect of the Channel Master is that External Antenna jack and the wire antenna that comes with it. It is a plain insulated wire about 8 feet long with a suction cup on one end and a special plug on the other that fits into the socket on the side of the radio. Unfortunately it is not long enough to add significantly to what you will receive with the built in antenna except in special circumstances…but in those cases it can be useful. There is a small leather pouch to hold it which clips to the shoulder strap so you can have it handy if desired. As a test I tuned to a 100 mile distant signal which in the daytime comes in listenably but with some background hiss. I rotated the radio to maximize the signal, then plugged in the wire and moved it all about. I could hear almost no change. I then disconnected the wire and turned the radio to null the signal, which disappeared completely. I then plugged the wire in again and the station came in about as well as it did with the built in antenna when it was aimed properly. This crude test demonstrates that this 8 foot wire received about as well as the built in ferrite rod but didn’t seem to add much if the radio was already aimed in the right direction. Of course it could thus be used to allow omni-directional reception if you wanted that. It could also be useful if the radio were in a shielded or noisy location where you could put the wire outside a window or in a windowsill to bring in a stronger signal. Or you could experiment with a longer wire which would certainly help more. 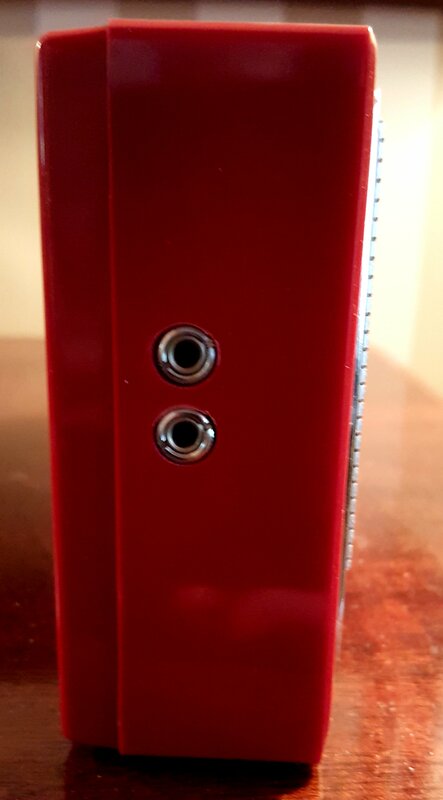 I view having an external antenna jack as a plus for those situations when it can help you…it is an added flexibility very few AM-only portable radios offer. For an experimenter like me I love this accessory and I plan to try some longer wires on this radio soon. Interestingly there is no mention of this Auxiliary Antenna jack or the included wire antenna in the owner’s manual…an odd omission since this is a relatively unique feature. Incidentally the “little brother” model 6506 has this external antenna as well. 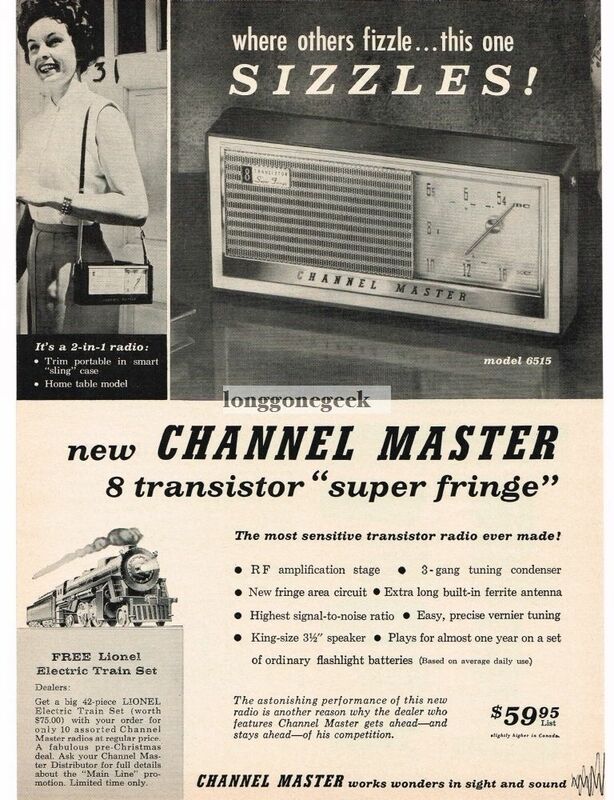 Conclusion: Contrary to their print advertising, the Channel Master 6515 Super Fringe is not “the most sensitive transistor radio ever made” – you only have to look at the Three To Five Star radios on the AM Mega Shootout list to find many that are. However it is one of a handful of portable radios that can compete with the Zenith Royal 500H in the mid-sized class of its era. In terms of both reception and sound it is certainly very different but on balance virtually the equal of that Zenith, with each outpointing the other on certain characteristics, and that is saying quite a lot. And once you see one in person I think you’ll also agree that the 6515 Super Fringe is quite a looker.